KALIMPONGJanuary29: All India Gorkha League (AIGL) has strongly condemned the arrest of Dr. Mani Kumar Chettri on the AMRI Dhakuria fire on December 9 last year that killed 91 people. 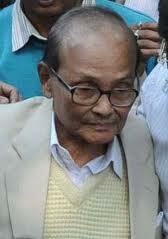 General Secretary of AIGL Pratap Khati said that CM Mamata Banerjee is trying to create communal disharmony. Banerjee knows that Chettri was a personal doctor of the former CM Jyoti Basu, he added.Mentioning more Khati said that the West Bengal police till date has failed to arrest the murderer of Madan Tamang. “All parties supported police in the case but they failed. Who’s name was written in the FIR”, questioned Khati.It is nothing but the communal ego behind the arrest of Dr. Chettri alleged Mukhia and demanded immediate release of Dr. Chettri.Similarly CPIM leader Tara Sundas said that arrest of 93 years-old doctor is not fair and humanitarian and also demanded for his earliest release.All political parties in the hills are demanding the immediate release of Dr. Chettri.